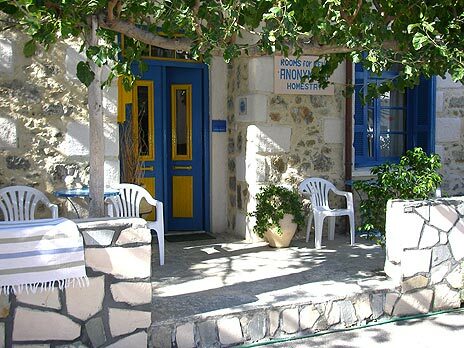 Guest house ANONYMOUS HOMESTAY is a 'Greek Family Style' Accomodation near the center of Paleochora(Palaiohora) in a Quiet Side Street. The 5 rooms surround a Beautiful Shaded Garden full of trees and flowers and Offer a Quiet place to Relax,while 2 more Rooms are facing the main side (they can be also rented as an Appartment). In front of each Room there is Space to sit and Read or Eat. We offer Books and back-gammons for Free. We have 7 rooms, 2 Appartments, all with private bathroom, ceiling fans, refrigerators,air conditioning (with extra charge) and shared cooking facilities. Klironomakis Familly take a good Care of our Quests. Greek, English and German are spoken. Travel agencies, Car and Bike rentals, Hotels,Rooms to sleep, Studios, 2 Camping grounds,Coffe shops, Bars,Discos, Endless variety of Restaurants from Pizza to local Meat to International Cousine to Vegeterian food .Supermarkets, Clothes Shops and friendly smiling people are all waiting to make your stay unforgetable ..